On March 16th, 2014, Russia staged a ‘referendum’ in Ukraine, seeking to justify the annexation of Crimea. One year and two weeks later, on April 1st 2015, an appropriately surreal event took place. 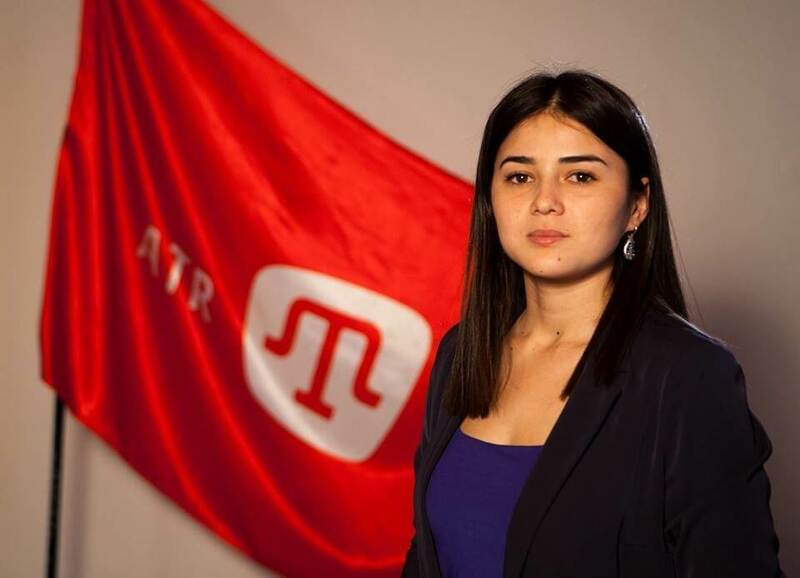 A year after the Russian invasion, Ukraine’s Crimean Tatar news channel ATR was taken off the air – on the orders of a foreign government. The Russian annexation of the Crimea is not recognized by Ukraine, or any relevant international body, but Russian control of the territory was already sufficiently consolidated for ‘authorities’ to crush any organization or individual that questioned their legitimacy. The ‘Prime Minister’ of the Kremlin’s Crimea, Sergei Aksyonov, would later explain that ATR – Crimea’s only independent broadcaster – was being closed down because it had been ‘defending Ukraine’s interests on the territory of Crimea’ which was ‘pointless and unnecessary’. ATR was making some allowance for the general opinion of the native Tatar population of Crimea that the annexation of Crimea was illegal, and that the result of the ‘referendum’, conducted by a foreign political state on Tatar lands, confers precisely no legitimacy whatsoever upon Moscow’s ‘representatives’ in Crimea. ATR’s output consisted of roughly 60 per cent Russian-language news, 35 per cent Crimean Tatar and 5 per cent Ukrainian-language news. Whilst Moscow has little tolerance for minority languages, the cultural make-up of ATR (technically, it favours Russian and Crimean Tatar over Ukrainian) should not have given the Kremlin much cause for concern. We can probably take Moscow at its word that their objections are chiefly political: as Aksyonov put it, ‘There are only restrictions for people who don’t recognise the reunion of Crimea with Russia’. (‘Reunion’ is deliberately misleading – Crimea has never been part of the Russian Federation. Aksyonov is harking back to Tsarist Russia). Since ‘people who don’t recognize the reunion of Crimea with Russia’ means all Crimean Tatars and Ukrainians, Aksyonov is merely asking for the total and unquestioning obedience of all non-Russians to the agenda of the occupying power. His boss, Putin, appears – or rather feigns – to be utterly perplexed by the world’s refusal to accept that the presence of Russian-speakers in a particular geographical region is a valid pretext for invasion. There is indeed an element of historical happenstance in regard to most international boundaries. Occasionally, they are even renegotiated: therein, of course, lies the crux of the matter. There was no negotiation. Crimea, in its entirety, was taken by force, precisely as Putin’s proxy armies are now attempting to take Eastern Ukraine’s Donyetsk and Luhansk regions, which Russian state media refers to as ‘Novorossiya’ (‘Greater Russia’ – although, again, none of these regions ever belonged to the Russian Federation). Mateusz Piskorski, the head of the ‘International Monitors’. Piskorski is a well-known Polish Anti-Semite and ‘open admirer of National Socialism’ (as Aleksandra Zasmorzhuk and Yevgeny Matyushenko reported in UNIAN, March 24th 2014). He is also a Holocaust denier and author of articles for “White World” portal and “Ya russkiy” (“I am Russian”) newspaper, former editor-in-chief of Polish skinheads’ magazine “Odala”, lauding the “Aryan race” and Adolf Hitler. He was present as an observer at the elections in [Russian-occupied Moldavian territory] Transnistria. Received an invitation from Russian observer organization CIS EMO’. This, remember, is the head of the delegation – hand-picked by Moscow as a model of impartiality! Bela Kovacs (Hungary) – representative of extreme right Hungarian party Jobbik, known for its assaults towards Jews and Roma. Ewald Johann Stadler (Аustria) – head of reformist-conservative party of Austria, MEP from Austria. Used to claim that Anna Politkovskaya (Russian journalist and human rights activist) has “organized her murder herself”. Zoran Radojicic (Serbia) – public activist, anti-Semite, forbidden from entry to Canada due to Holocaust denying. Charalampos Angourakis (Greece) – MEP from Greece… with reputation of neo-Stalinist. Luc Michel (Belgium) – MP’s assistant in Belgium, follower of Jean-François Thiriart, well-known as “major Belgian Nazi”. In Belgium Michel’s organization supports nationalistic party “Vlaams Belang”, whose representatives are not accepted in [the] political community. Luc Michel observed elections in [Russian occupied] Abkhazia and Transnistria and recognized them as valid and… with no violations. Christian Verougstraete and Frank Creyelman, also of Vlaams Belang, the far-right Flemish party. (There are several political movements favouring Flemish independence from the rest of Belgium: this stance is not especially controversial, but Vlaams Belang combines their secessionism with an overtly racist political ideology). Fabrizio Bertot (Italy) – MEP deputy from Italy. Was a mayor of Torino suburb. In 2012 was banned from his duties because of ties with the Mafia group Ndrageta [sic: Ndrangheta], among the most powerful in the world. Кiril Kolev (Bulgaria) – deputy of extreme left national-communist party АТАКА, head of youth organization of АТАКА party, which is known to be ultra-nationalistic, anti-Semite and racist. Erkki Johan Backman (Finland) – pro-Russian sociologist, publicist. Neo-Stalinist, Holocaust denier. Banned from teaching at the University of Helsinki. In 2009 declared “persona non-grata” by secret service of Estonia as a person “threatening state security” of the country. Nick Griffin (Great Britain) – leader of extreme right “British National Party”, accused of preaching racial hatred. (Accused very credibly, I might add, as a British/Welsh citizen). Aymeric Chauprade (France) – special advisor on international affairs of National Front of France leader Marine Le Pen. Known for his criticisms and sharp statements concerning Euromaidan and European future of Ukraine. (The founder of the Front National, Jean-Marie Le Pen, is mainly known in Europe for describing the Holocaust as ‘a detail of history’ and consistently far-right and racist views). This is merely a small sampling of the ‘impartial observers’ prepared to give their blessing to the March 2014 ‘referendum’. The French National Front (Front National) received a loan of nine million Euros from the Russian authorities in return for its support, as reported in the UK’s Independent newspaper (April 4th, 2015). The nearest thing to ‘inclusivity’ here is that the delegation included a handful of extreme left-wing/Stalinist racists as well as members of far-right/fascist groups – and at least one Mafioso for good measure. Keeping an element of self-awareness safely out of the Russian public’s mind has taken a huge propaganda effort. It has also necessitated the suppression of any independent media in the Crimea, of which the closure of ATR represents the most shameless manifestation. 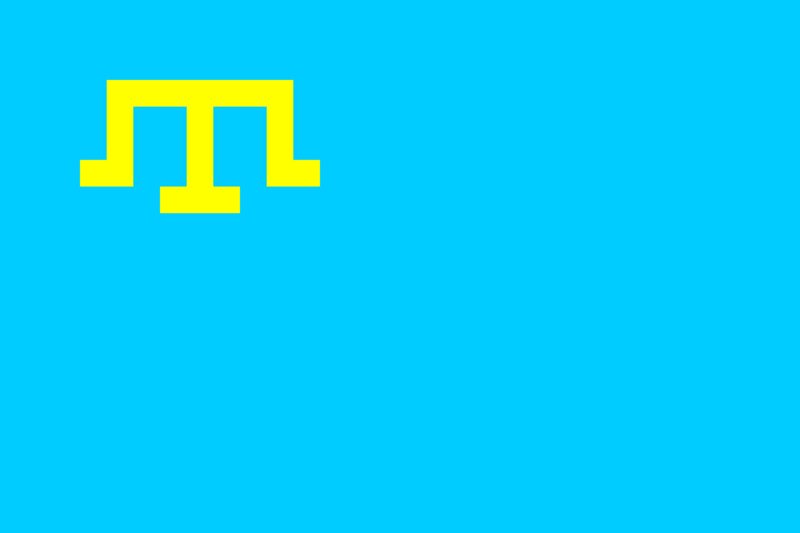 The flag of Crimean Tatarstan. (by Riwnodennyk / Wikimedia). Some Rights Reserved. ‘In the run-up to ATR’s closure, Aksyonov said the existence of a channel that created social tension by giving hope that Crimea would return to Ukraine was “unacceptable”,’ the Moscow Times went on to report. Notice that no specific infringement of broadcasting standards were presented (or even fabricated): the simple existence of independent media, allowing a different analysis to the Kremlin’s, was in itself ‘unacceptable’. These days, Russia is increasingly bereft of such ‘unacceptable’ media: RIA Novosti was wound up in 2014, and replaced with a more acceptable Kremlin-sponsored clone, under the RT (Russia Today) aegis. Harassment against ATR is part of a broader pattern of gradually pushing Ukrainian media from Crimea’s air waves and stifling all pro-Ukraine media. Authorities raided offices of several media outlets, sometimes confiscating or damaging their equipment. Numerous journalists and bloggers critical of the authorities have been detained, harassed, or attacked. International bodies justly criticized the stifling of Crimea’s independent media […] the Organization for Security and Co-operation in Europe’s representative on media freedom described the situation in Crimea to be “at an all-time low”. ‘The Crimean Tatars, who suffered incomparably more in the wake of their deportation, will build their own home on their own land. […] Yes, we today are ending our broadcasts, but we know that we will be returning. We will always return. And we will say again, This is ATR television on the air. ‘Dzhemilev said there were cases when the fact of the disappearance of individuals was used [as] a threat during interrogations by security forces. The disappearance of people is often used by security officials as a threat during interrogations. If the people questioned by the FSB (Russian security service officers) retain their dignity, they can be asked whether they are afraid that they or their children may disappear as well. In addition to highlighting the harassment of activists and the eradication of non-Russian media, Dzhemilev sought to bring to the world’s attention that approximately 200 homes, mosques and schools belonging to Crimean Tatars have been raided since the Russian take-over. “What annoys us is why many states abstained by not participating in the vote,” he said, referring to the UN resolution vote on the annexation of Crimea two years ago. “A country invades and occupies another one and annexes it in the 21st century just like in the Middle Ages. This does not concern and worry them”, Dzhemilev told the Turkish news web-site World Bulletin. Most of this is not being reported in the global media, except by Ukrainian or Turkish news agencies. The same is true of the erroneous nature of the Kremlin’s narrative that Tatars are ‘suspicious’ because they’re Muslim while ethnically Slavic Ukrainians are simply ‘fascists’ – the irony of which is noted above, especially in regard to the referendum ‘monitors’. Whereas the Crimean Tatar leaders call upon the Crimean Tatars to resist the Russian provocation and to remain nonviolent, the Russian government continues its provocation by publishing erroneous assumptions about Crimean Tatars and falsely linking them with Islamic radicals. With the implementation of the “self-defence” parliament and the increasing number of Crimean Tatars’ disappearances, the Russian goal is clear: Crimean Tatars and other threatened minorities in Crimea should either surrender or flee to mainland Ukraine. UNPO goes on to quote a report by Human Rights Watch in Ukraine which notes, amongst other things, one of the earlier FSB murders: Reshat Ametov, ‘whose mutilated body was found on March 16 ’. It is no accident that the announced application by the Russian Justice Ministry to close the renowned human rights organization Memorial coincided with a defamatory TV programme alleging that the organization is hand in glove with terrorists and radicals now fighting for the Islamic State. The suggestion that hard-line Islamists are being sheltered by the Crimean Tatars deserves as much respect as the same suggestion about Memorial, or the many other human rights organisations expelled from Russia and Russian-occupied territories, for speaking truthfully about covert Russian military operations and unlawful police actions against ‘internal’ dissent. Back in the real world, Crimean Tatars are ‘colluding’ only with patriotic Ukrainians and people of conscience – Tatar, Ukrainian and Russian. Meanwhile, global mass media remains largely silent, likely because they are unable to ‘find their angle’. One can only hope that they decide to run with the truth – that the Crimean Tatarstan’s future is under threat precisely because it poses no danger to others. With Independent media eliminated/exiled, political representation outlawed, and Tatar activists being ‘disappeared’ Moscow is now also suppressing the Crimean Tatar assembly – the Mejlis. A good summary of current developments comes from the Anadolu Agency out of Turkey. The Kremlin line regarding both the closure of ATR, and the closure of the Crimean Tatar assembly is that these long-established entities were ‘promoting extremism’. It is a remarkable claim that both Tatar political institutions and media outlets – having caused no concern to the Ukrainian authorities for at least the past three decades – all became ‘Muslim extremists’ in less than two years. The Kremlin’s sad supposition aside, both Ukrainians and Tatars are taking action – in the form of a blockade against the Russian puppet-state. As a result, the hostile government will find it harder and harder to remove the people’s voice let alone with a single Presidential decree. Meanwhile, ATR continues to broadcast live online.